Robin Bequet Caramels for sale. Buy online at Zingerman's Mail Order. Gourmet Gifts. Food Gifts. New flavors! Sea salt, butterscotch and salted mocha. That's a voice of experience talking. In going from a home kitchen operation to an award-winning caramel maker, Robin has had a lot of experimental disasters. But we get to taste the benefits of her hard lessons. Her caramels are widely recognized as some of the best in the country. 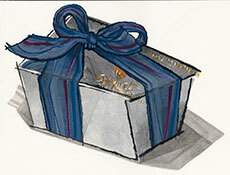 This silver, ribboned gift box is filled with three of our favorite types: sea salt, butterscotch and salted mocha. Caramel fans, don’t miss out.